At the business mogul level, you are not just a business person, you are a business. And in order for the business of you to operate you must promote that personal brand. Today’s content consumer (everyone) has grown to expect a high level of transparency before trusting or valuing a person. Because each person truly has the ability to communicate directly with an audience, any lack of that communication diminishes the value and trust. The moment a person’s influence and value begins to be evaluated, the content that has been distributed for the person’s brand is going to be deeply researched and examined. It is critical that not only are massive amounts of content readily available, but that it is current, consistent, transparent, full of value, and most importantly “Real”. The SWOT Analysis of your Personal Brand. 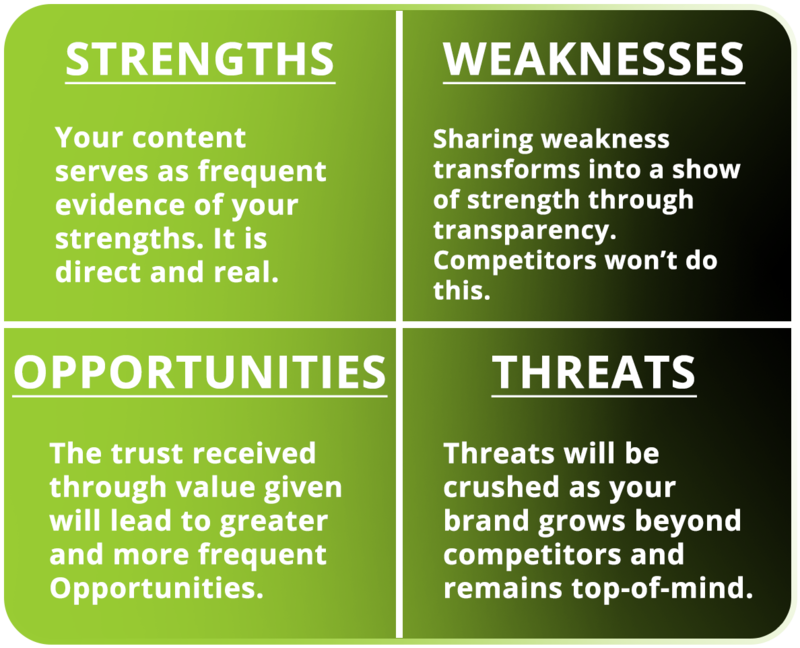 Strengths and Weaknesses – These are the things that your content will reveal. They make you relatable and real to your audience. Your content will be evidence of your strengths. When weaknesses are shared, they become strengths because your competitors won’t have the guts to expose themselves, thus not creating a genuine relationship with their audience. Opportunities and Threats – The trust that you will obtain and the value that you will impart become magnets for opportunity. Threats will be diminished as your brand grows beyond that of your competitors. Think Tesla vs Nissan. Both have electric cars, but the value and connection to innovation of Tesla is difficult to rival. The innovation of a Tesla doesn’t stand alone, it is the story that we’ve watched and the media attention that has built the brand that you perceive. This is a new requirement that many don’t get. Your audience must be able to relate to you. What parts of your personal life are you giving them that allows them to relate to your personal brand? When your industry or area of expertise is mentioned, you want to be one of the first names that comes to mind as a leader. When was the last time they heard directly from you? Are you affirming and spreading your value to enough people. Having value is one thing, sharing it gives it 10x the worth. Are you consistent with providing valuable content to your audience. Allow your audience to predict when they will hear from you again.